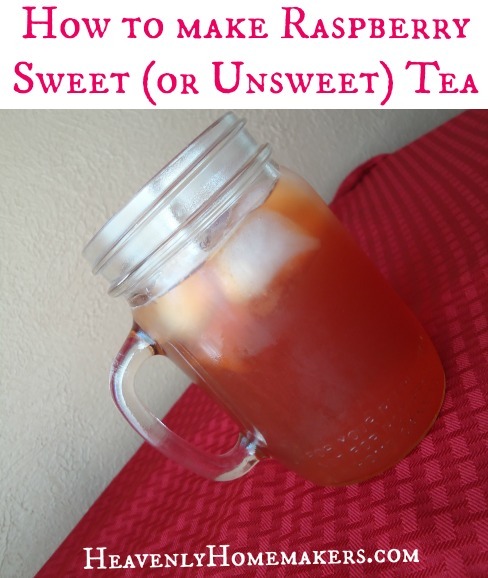 Today I present you with Raspberry Sweet (or Unsweet) Tea. Before you add a bunch of sugar, you might test it to see if you like it as-is, or at least with less than your usual amount of sugar. The fruit really adds a delicious natural sweetness that we are loving! In a medium-sized pot, heat 1 quart of water and the raspberries to boiling. Add a teaspoon of sugar or honey if you like. This will help make a "raspberry syrup." Simmer for about five minutes. Mush the raspberries in the water and add the tea bags. Allow tea to steep for 5-10 minutes. Strain tea into a ½ gallon jar or pitcher. Add a quart of water. Stir in stevia or sugar if you want your tea sweetened. Notice how the Raspberry Tea naturally has a red tint while the Mango and Peach teas have a naturally orange-brown tint? This is the stuff “no artificial colors or flavors” is made of. Strawberry?? Do you think that will be good? Something with Lemon and/or Lime? 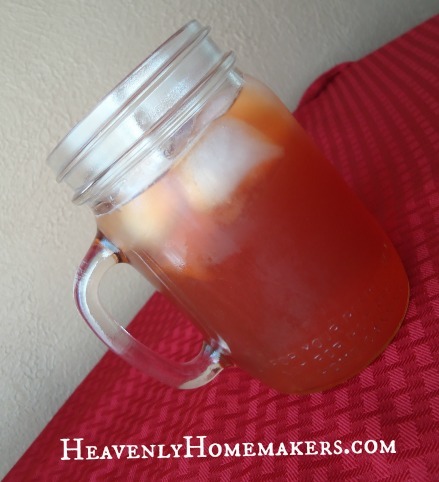 I’m loving the treat of these iced teas this summer! This is probably a really dumb question, but when you strain the raspberry syrup tea mixture, does that get the seeds out? I love all berries, but for health reasons I’m not supposed to consume the seeds. Since berries all have seeds, I can’t have them unless I can figure out how to get rid of the seeds. Any suggestions are greatly appreciated. I’m so glad you asked – I meant to suggest this in the post! I use a mesh strainer like this one for the seeds. https://www.amazon.com/gp/product/B0184C9WZ4?ie=UTF8&tag=wwwheavenlyho-20&camp=1789&linkCode=xm2&creativeASIN=B0184C9WZ4 Makes it super easy! Coconut lime or pineapple coconut (pina colada tea?)??? Just a thought. Not sure how it would taste, but it might just be worth a try. If the coconut is too weird, how about just pineapple? And yes, definitely strawberry! And I’m wondering about mint (or chocolate mint, which is actually a mint, in case you’ve never heard of it like I hadn’t). This sounds delicious and refreshing, while still being healthy! Just a “housekeeping” question: Are we supposed to rate a recipe just after reading it, or after actually trying it? Thanks again, Laura, for another wonderful recipe. After you try it would be best, so you can rate it depending on how you liked it! May I ask what kind of tea you used? I have never bought tea before so I don’t know where to begin! Nothing real strong and I have liked the flavor of green tea when I have purchased it flavored.